This oil painting is typical of the artist's picturesque style, influenced by Dutch traditions. Such depiction of the effects of light and atmosphere was very popular with the major patrons of the day. Augustus Wall Callcott (1779-1844) was trained at the Schools of the Royal Academy and was principally a landscape painter whose preference was for coastal and marine scenes. This view was executed late in Callcott's career. It reveals a similarity between his work and that of the 17th-century Dutch lanscape painters that was being eagerly collected in Britain. The painting, which depicts a herd of cattle with the Dutch town of Dort or Dordrecht in the distance, is typical of thousands of landscapes in the Dutch style. The imagery of a townscape in the background, with its tall spires, and the peaceable cattle in the foreground, was a useful formula for the imitation of old master painting by British Victorian artists. 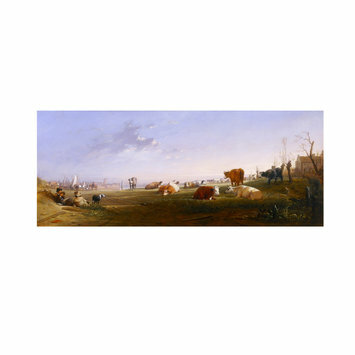 Oil painting depicting cows with Dordrecht in the background. Oil painting by Augustus Wall Callcott depicting cows with Dort or Dordrecht in the background. British School, 1841.